As the name suggests, these HAPS aircraft are designed to occupy the space between drones and satellites, soaring to altitudes as high as 20,000 m (65,600 ft). From that vantage point, they're able to monitor the environment in the atmosphere and back on the ground, beam internet or radio communications over long distances, or perform military surveillance operations. The Airbus Zephyr is one such project, and until recentlyFacebook had been trialling a program called Aquila that was designed to beam high-speed internet to the world. UAVOS' aircraft, the ApusDuo, follows a similar design, with two long parallel wings connected and supported by three perpendicular struts. 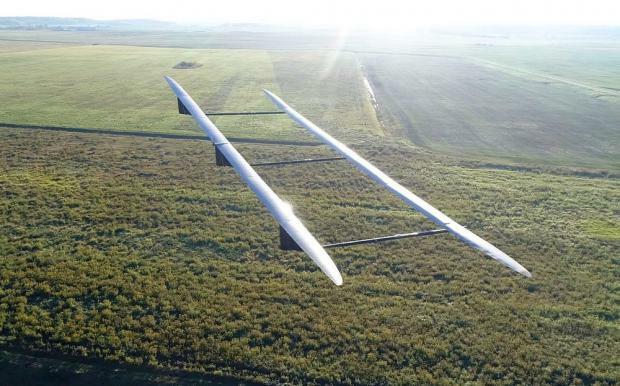 The wings are lined with solar panels for power, and can autonomously bend and flex to keep the craft airborne for long periods – up to a year at a time, according to UAVOS.